Due to the highly invasive nature of traditional surgery and the limitation of gas-filling laparoscopic surgery in gastric cancers, we developed a new method of gasless laparoscope-assisted subtotal gastrectomy (GLASG). 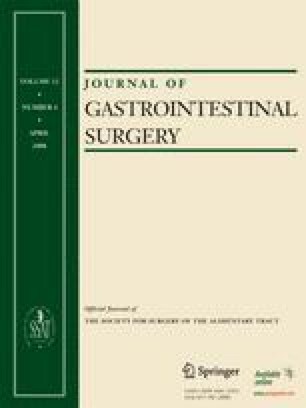 This study investigated the technique and clinical results of this procedure and compared it with traditional radical subtotal gastrectomy (TRSG) for early gastric cancers. From December 2004 to January 2006, 41 patients diagnosed with early gastric cancer were included in the study. All cases underwent subtotal gastrectomy with standard radical lymph node dissection. Twenty patients underwent GLASG, whereas the other 21 patients underwent TRSG. In the GLASG group, we performed our newly developed method using three working ports created at the bilateral subcostal and umbilicus, which provided a 3-dimensional sensation by direct vision through a minilaparotomy and laparoscopic view simultaneously. B-II gastrojejunostomy reconstruction was performed by intracorporeal anastomosis using an endostapler. The TRSG group underwent the standard open method used for gastric cancer. Preoperative characteristics and postoperative recovery between the two groups were compared. The operative time was comparable between the two groups, but the bleeding was significantly less severe in the GLASG group. Postoperative pain was significantly less in the GLASG group, as well as body temperature from postoperative day 2 to 7. The number of days to first flatus, first oral intake, and discharge were all significantly less in the GLASG group. No major complications were noted in either group. GLASG may be a feasible and safe procedure for early gastric cancer. Gasless laparoscopic gastrectomy has the advantages of less pain, better cosmetic outcome, and earlier recovery. The newly developed gasless environment may hybridize the advantages of open method and pure laparoscopic method. This paper was invited to be presented at International Society of Digestive Surgery, Roma, Dec. 1st, 2006.